Danna graduated from Texas A&M University with a BS in Sport Management (and a minor in business). She is married to Michael, and they have a son, Owen, a daughter, Emma, and two dogs, Boone and Paisley. 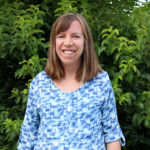 During the summers in college, Danna worked at a Christian summer camp and served in the roles of counselor, aquatics director, and girls’ camp assistant director. After college, she worked at the Southern Baptist Theological Seminary in Louisville, Kentucky as secretary for the Health and Recreation Center and as the procurement assistant. Since moving back to Texas, she has worked as a nanny and personal assistant, along with being a stay-at-home mom. Danna loves working with kids and building relationships with the ACS students and their families. Her desire is for them to know she’s here to help them and that she is able to show the students how to work hard, love the Lord, and be an encouragement to others.